No, it is not in your head, gluten free baking is more complicated than baking with wheat flour. It is more difficult to get consistent results. Why? That is the question. This week I am going to share what I have learned in my years of gluten free baking so that you will be able to make your holiday favorites with more confidence. With wheat baking there are basic flours, all purpose, cake, bread, pastry, whole wheat, etc. Each of these types of wheat flours are manufactured to consistent standards. In other words, when you buy all purpose flour in New York or London or Timbuktu, it has the same fineness of grind, will hold the same amount of moisture, will weigh the same per cup and will work the same every time you make a recipe. This makes it easy to get consistent results. There is no single GF flour or combination of GF flours that is able to replace wheat flour in every recipe. Everyone comes up with their own combination of gf flours to mimic what wheat flour would do in a recipe. That is why there are so many types of GF flour mixes on the market and why each recipe on-line or in cookbooks uses so many different types of flours. Most GF recipes use a combination of flours. The key to success is finding the right combination. The bulk of a GF flour blend is made up of grains such as sorghum, rice, buckwheat, oats, etc. Protein flours, such as chickpea or other beans, almond or other nuts & seeds, etc., help to give structure to the baked goods. Starches, such as tapioca, arrowroot, potato, corn, etc., help to make a lighter product. If you do come up with your own successful flour blend, then there are other issues that come into play to complicate matters. There are no standards to gluten free flour production and every manufacturer of every flour just makes up their own specifications. Each brand has its own fineness of grind, holds different amounts of moisture and weighs a different amount per cup. So, if you buy one brand of rice flour and the recipe comes out great and then next time you buy another brand of rice flour the recipe may come out quite differently. If this is not difficult enough, then you will find that each company might also have variations of their grind in each manufacturing plant. So, if you buy your GF flour in New York and then move to San Francisco, your tried and true GF recipes may start giving you different results. You will have to make adjustments and tweak the flour blend again. Another thing that affects results is that everyone measures the flours differently. So one cup in a recipe may be different from one cup the way that you measure it out. The big controversy is whether to dip or scoop the flour. I like to dip the measuring cup into the fine flours like tapioca, arrowroot or cornstarch and then level the cup off. I like to use a spoon to scoop out the flour into the cup for heavier flours like, sorghum, chickpea or rice and then level it off. There can be as much as 1/2 cup or more difference in the amount of flour in a recipe according to how each flour is measured out. The best practice is to weigh out the flours, grams are the most accurate way to measure. Again, there is a catch. The weight of one cup of GF flour will vary according to brand and according to how the person who wrote the recipe measured out the flour. In other words, one cup of sorghum in my recipe the way I measure it out is 128 grams or 4.5 ounces. Other GF recipes list different weights. Some sources list how much their flours weight and this will help to recreate their recipe as they intended. This is a helpful conversion chart for US to metric measurements. Substituting different GF flours than the ones called for in a recipe usually will produce different results than the original recipe. Sometimes I have to substitute a flour due to a sensitivity of someone I am baking for or because I don’t have that particular flour on hand. Substituting one starch like flour for another causes the least amount of problems in a recipe. Tapioca flour can have gummier results than other starches, so depending upon how large a percentage of the flour mix it is there may be a texture problem. Substituting grain & protein types of flours causes the most variations in a recipe's results. The following substitutions have worked for me in most recipes. Tapioca = corn = arrowroot = potato starch (not flour). In all baked goods, except breads, I find that this combination works well to produce a wheat flour like texture. The best way to get more consistent results is to find a brand of GF flour and stick with it. Come up with the combination of flours or a pre-made mix that works best for you and use this to get results that you can depend on. Take the time to weigh out the cup of each flour as you measure it out. Write it down so that you can then consistently recreate the recipes the way that you like them. I have a chart of my flour weights and flour substitutions on the fridge for quick reference. Wheat flours have gluten in them. Gluten acts like a glue and holds baked goods together. With gluten free baking, in most cases, it is necessary to add things to the batter or flour mix that will act like gluten to help hold baked goods together and keep them from crumbling apart. When I first started baking with gluten free flours I did not know about binders. I will never forget my first batch of cookies. I was so delighted that they looked wonderful, but when I bit into one it fell apart and crumbled into sand. Not the texture you want in cookies. Gums are the most commonly used addition since they are binders and emulsifiers that act like gluten. Xanthan gum is a bacteria that is typically grown on corn, but is sometimes grown on wheat. Some people who are very sensitive to corn or wheat cannot tolerate xanthan gum. Guar gum is made from a seed and is less expensive than xanthan gum. I have read that xanthan gum works better when heat is used and guar gum better in cold applications. 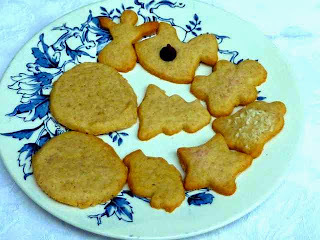 I usually use xanthan gum when baking, but guar gum has acted the same when I did use it to bake. Some people prefer not to use the gums and use things like pectin, ground flax or chia seeds, agar and gelatin. I can not speak to these ingredients as binders as I do not have much experience using them. There are plenty of blogs out there that have good information about how to use them in GF recipes. Here is one blog that might be helpful. GF cake and bread batters do better when beaten for about 3-5 minutes or more. This makes a lighter product by adding air to the batter. Unlike wheat baking, there is no gluten to over mix and toughen the dough or batter. I find that the more I beat the batter the better. GF dough is softer and wetter. Most people come up with their own techniques for working with the dough. For rolling out doughs, I find it easiest to place the dough between two pieces of plastic wrap or waxed paper and roll it out. I do not recommend adding additional flour to the dough to get a wheat dough like consistency as this usually results in a tough hard product after baking. 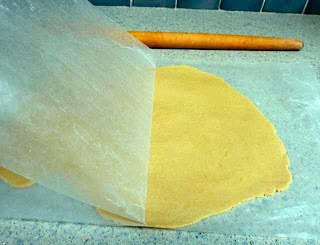 Rolling dough between two pieces of wax paper. For cut out cookies or shapes I find it works well to chill the dough between each step. Chill the dough & roll the dough; chill again & cut out the shapes; chill again & lift out the shapes to place on the baking sheet; chill again & bake. Yes, it does take longer and it is a lot of work, but that is how to get shapes that are cleanly cut and hold their shape while baking. Raw cookies cut out. Chilled after each step. For pie crusts, it is best to chill the dough before rolling it out between two pieces of plastic wrap. Remove the top piece of plastic and invert the dough into the pie pan. Use the plastic that is now on the top to press the crust into the pan. Remove the plastic. 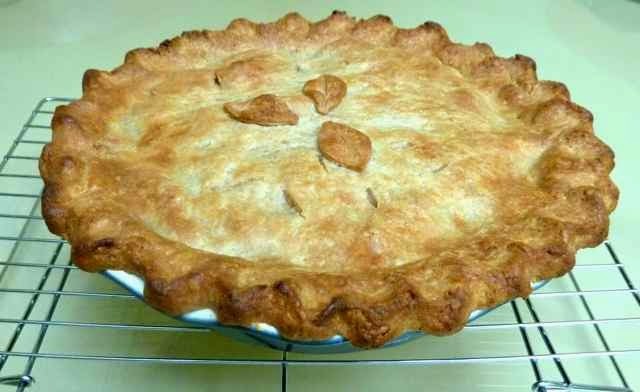 Whether you bake the crust empty or with filling, chill the pie very well before baking. This will keep the crust flaky and light and help hold its shape during baking. Peeling off the top wax paper after pressing the pie crust into the pan. For thicker doughs like biscuits, scones, biscotti, etc. It is best to use wet hands to shape and smooth out the dough. 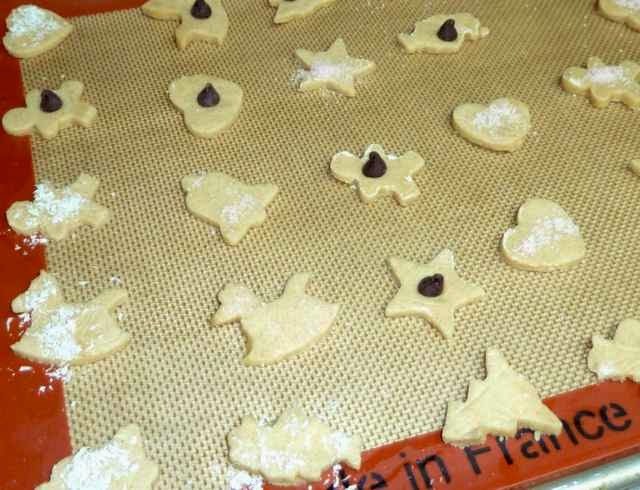 Shape the baked goods a little higher than you want as the dough will flatten or spread out a bit as it bakes. Bread batters usually come out more like a cake batter and need to be baked in a pan. Smooth the top with wet hands. Some bread recipes actually do come out like wheat dough in texture and you can shape them easily, but this is not typical. Invest in an oven thermometer to insure that the oven is the correct temperature. It can take much longer than you think to preheat an oven. Often the oven will signal that the correct temperature has been reached, but the thermometer will indicate that it is off by 50℉ or more. It can take over half an hour to preheat an oven. You also may find that you will have to adjust the dial on your oven to achieve the desired temperature. With gluten free baking it is especially important to have an oven that is at the correct temperature in order to get a good rise on breads and cakes and prevent the dreaded sink hole. Gather all the ingredients. Make sure that if the recipe calls for ingredients to be at room temperature, chilled, hot, etc., that they are at the required temperature. Use the correct size pans. If you do not have a pan the size that a recipe calls for then you should look up how to adjust for baking times with different pan sizes. You can also check to see what other pans are equivalent in size even if they are a different shape. Make sure your baking powder, baking soda or yeast are active and fresh or your baked goods will not rise (and will be dense and flat and unappetizing). To check if baking powder is fresh add some to 1/4 cup of warm water, if it fizzes it is still active. To check if baking soda is still working add a 1/4 tsp of white or apple vinegar to 1/4 cup of water and put a pinch of baking soda in. If it fizzes it is still good. To test yeast, add 1/2 tsp of sugar or honey to 1/2 cup of 110℉ water and dissolve add the yeast and stir. Let it sit for 10 minutes. The yeast should foam up, if not get new yeast. Follow the directions. There is usually a very good and necessary reason (even if it is not spelled out or explained) that the steps are there and in a certain order in the recipe. With cooking it is safe to experiment with ingredients and amounts, but baking is more like a chemistry project and changing what you use and how much can cause a disaster. Make the recipe as written the first time and then adjust it if you are not happy with it. Look up guidelines for baking substitutions before you change things up. Scoops are very helpful to measure out equal portions of cookies, biscuits, fillings and cupcake batter. Scoops come in all sizes. Check for doneness 10 minutes before the recipe says it will be done. Your oven might bake things faster than anticipated. Keep an eye on the baked goods during the last 5-10 minutes to prevent burning or over baking and drying out the products. A quick read thermometer is very helpful to check on the doneness of breads. A cake tester is good for checking on the doneness of cakes. 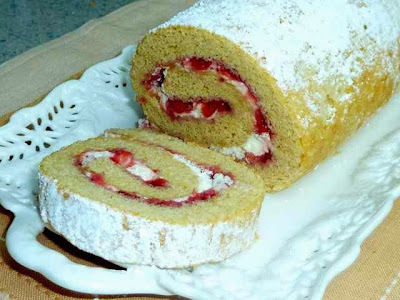 I find the gentle press of a finger to see if the cake springs back works best for me to check for a cake’s doneness. Taking cakes out of pans can be tricky. Try to take the cake out too soon and it may break apart. Leave it in the pan too long and the sugar will crystalize and glue the cake to the pan making it removable only by scraping it with a knife and spatula (how do I know this?...). When no instructions for cooling are given what works best is the following method. Take the cake out of the oven and place on a cooling rack. Run a knife around the edge of the cake. Set a timer and let the cake cool in the pan for 10 minutes. After 10 minutes invert the cake onto the rack to cool completely. Sometimes a recipe will tell you to remove a baked good from the pan immediately or cool in the pan, etc. I find it is best to do what the recipe says. I hope that this information helps you to have more success with your gluten free baking. Feel free to ask questions, I love to help if I can. Hi Bryna, I just discovered this post! It's wonderful. I was wondering about many of the things you mentioned - one of them being the way(s) to measure out the flours. I've been using a spoon to measure out all the different flours! Whoops! lol As I'm a lazy baker, these hints will come in very handy. Thanks!